I’ve been thinking about these whole fruit banana pops for some time now. 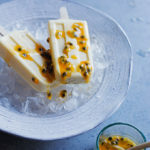 I mean, there are all those recipes for that 1-ingredient banana “ice cream” out there and I’ve been like, “I should make that into a popsicle!” Then, I would forget about it. But! I finally got it together and covered them in chocolate shell, peanut butter, peanuts, and wouldn’t ya know…they’re even vegan. BOOM. I blitzed up a few of the dozens of super-ripe bananas that take up residence in my freezer and piped it into my popsicle molds. Then, they sat there for a few days while I tried to figure out what to do with them. I mean, they would be a health food if I left them alone, but they’d also be kinda fugly. Last week my new friend, Kailey, was over and I mentioned I was going to chocolate-dip them and she suggested I add peanuts. Then I decided, why stop there?! I’ll drizzle them with peanut butter, too. And, thus, these magical banana pop babies were born and they are SO GOOD. Make them, seriously. Makes about 10 pops using this mold. For these to be vegan, be sure to use vegan chocolate and peanut butter. Bananas are already vegan. Break or cut the frozen bananas into chunks (or freeze your bananas in chunks) and pulse in the food processor until smooth and creamy. Spoon or pipe the pureed bananas into the popsicle molds, insert sticks, and freeze for several hours (or days). When ready to coat the pops, line a baking sheet with parchment and place in the freezer. In a microwave safe bowl, combine the chocolate and 2 tablespoons of the coconut oil. Heat in the microwave in 30 second bursts, stirring between each, until the chocolate is melted and smooth. In another microwave safe bowl, combine the peanut butter and remaining coconut oil and repeat the same procedure as you did with the chocolate. 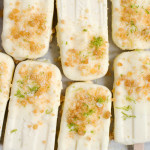 Remove the banana pops from the freezer and carefully un-mold the pops. I had to run them under just warm water for a few seconds to get them out without breaking. Working quickly, dip the pops into the chocolate, using a spoon to help coat the pops completely, let any excess chocolate drip, and place on the prepared baking sheet. Repeat with the remaining pops. Stick the baking sheet back into the freezer until the chocolate shell is completely set. 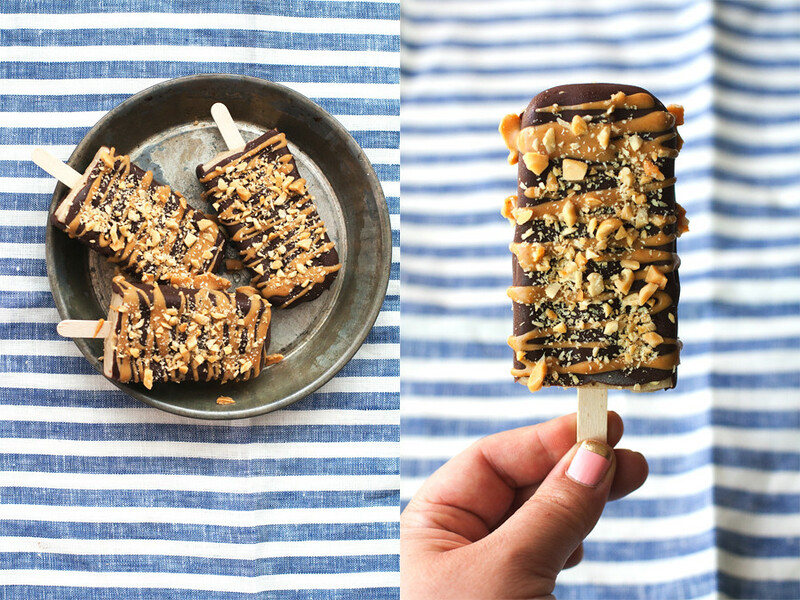 Once set, drizzle the pops with peanut butter and sprinkle with chopped peanuts. Place the sheet back into the freezer until set. Can be stored in the freezer for several days. Whoa. These pops? These are my dream. All my fav flavours are in here!!!!! GAH! Love these! They remind me of the frozen chocolate coated bananas we had as kids, except way better! Yes! I agree, they are easier to eat than those frozen bananas because they don’t get quite so frozen solid. What a perfect idea! 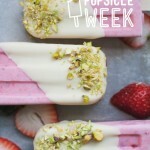 I think it’s finally time for me to buy popsicle molds. What brand do you use? I couldn’t get the link at the top of the recipe to work. Thanks, Becky! They are Progessive brand. These are pretty brilliant. I love the peanut butter drizzle! P.S. love your manicure in the second pic! Yum, yum, yum. The combo of chocolate, peanut butter and better will always be one I can never turn down. These sound awesome!! Yessss!! I mean, this is perfect. Everything! These are perfect! A little chocolate and drizzle action for the win! They definitely help fulfill those pregnancy cravings! THESE SOUND INCREDIBLE!! Such a great combination of flavors! 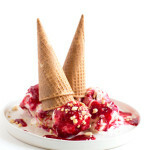 I love a little texture in my frozen treats so kudos to your friend for suggesting the peanuts!! I agree! It’s all about texture! Cindy, I sure like the way you think :) I eat banana ice cream a lot and try to feel virtuous because it’s not a quart of ice cream but…it’s just not the same as a quart of ice cream. So these pops may have just made me fall head over heels. Because peanuts, chocolate, and peanut butter? Can life get any better? 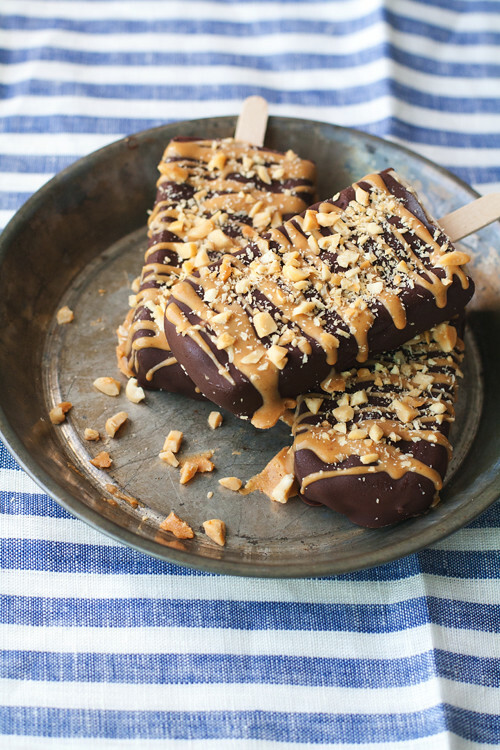 I’m not into bananas….but the way these look…and the peanut butter…and the chocolate…and your styling. YES, I MUST HAVE ONE. This sounds so so delicious!! I always have over ripe bananas in my freezer, so I now what to do with them next time!! These look and sound amazing. I still haven’t tried the 1 ingredient banana ice cream yet, and have really been meaning too. I think now I’m convinced! 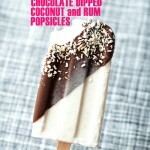 These sound super delicious – love chocolate dipped bananas so I can imagine these are divine! Gorgeous pictures too! WOW! These just scream summer and combine 3 of my favorite flavors. Well done! …. definitely craving one of these pops NOW. yum they look divine! thanks for sharing another great recipe – definitely one i will be recreating! I feel sort of stupid, but I can’t get the print button to work. Don’t! It may be a glitch on my end. I will have my guy look at it tonight. And to think I thought I could never be vegan because I would miss out on delicious desserts. This looks amazing! Mixing Chocolate PB2 into the bananas before piping it into the molds will give the flavor for very few points. 2 tbs of PB2 = 1 point. Not the decadent thrill of this version but an acceptable substitute for me. I make banana soft serve all the time! 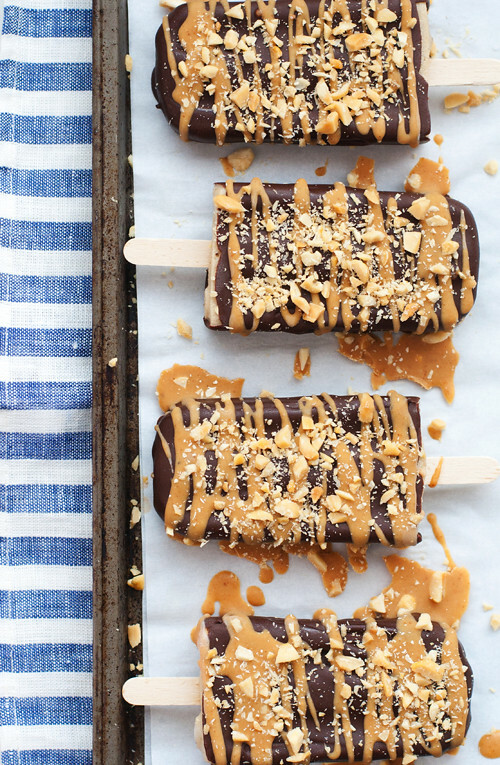 Putting it into popsicles is a smart idea – and the addition of chocolate, PB, and peanuts – well, you’re pretty much a genius. But I already knew that. OMG WOMAN YOU’RE FREAKING AMAZING. Your photos slay me. These look so so good!!!!!!!!! These sound incredible. And it cracked me up that you said fugly. I haven’t used that word in a long time. Too funny. Oh my gosh, I want a million of these. 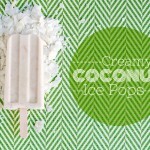 This is the greatest popsicle EVER!!! Boom!!! Mind blowing!! !